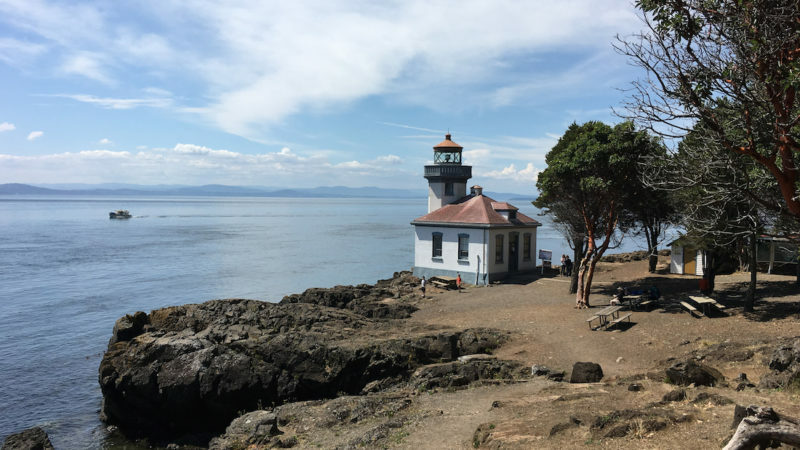 On a recent road trip through the Pacific Northwest, I hopped the Washington State Ferry to discover San Juan Island. Its history, whale-watching and fields of summertime lavender had me hooked. After landing, I discovered an island without a traffic light where the only congestion happens at the ferry terminal on Sunday evening. San Juan Island is located in the Strait of Juan de Fuca along the Canadian border. This island boasts a temperate climate with unique shoreline whale-watching. An ideal destination for families with a slow, island pace. 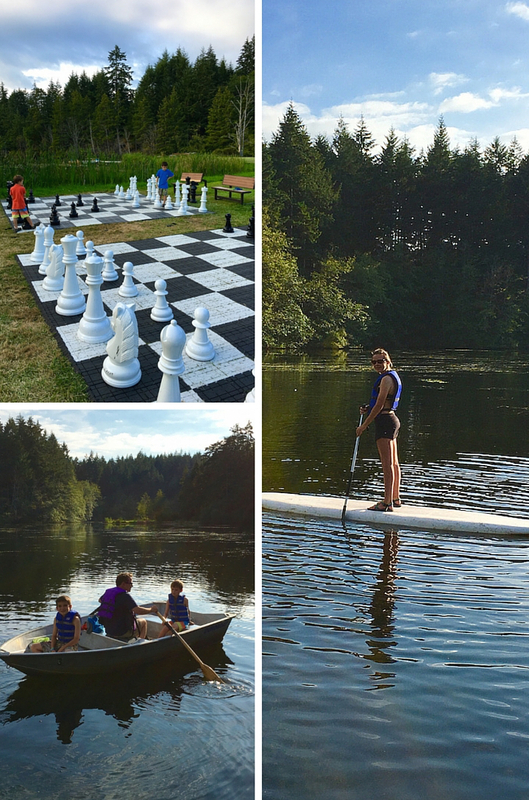 Family friendly activities range from exploring the island bike, kayaking with older kids, hiking and glamping. 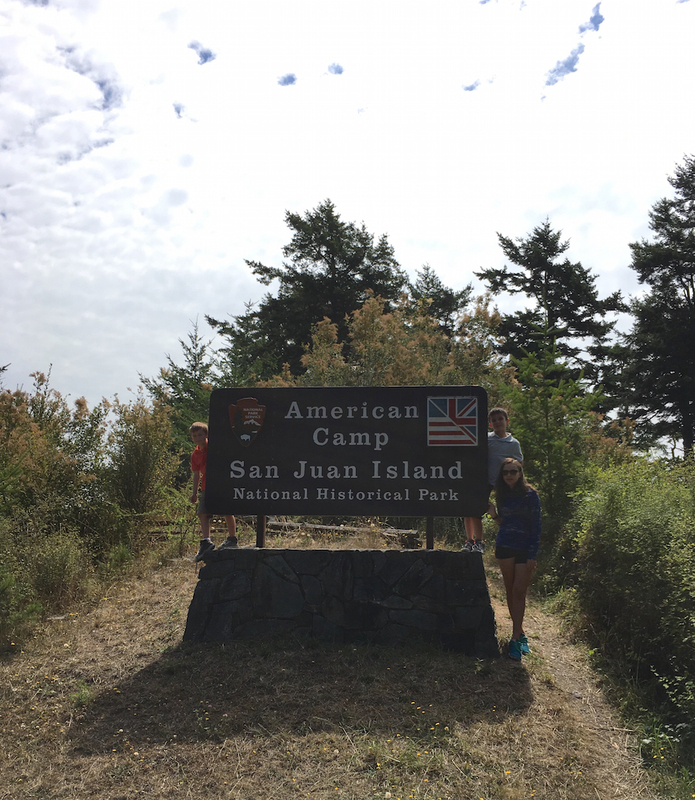 San Juan Island National Historical Park celebrates the success of peaceful arbitration between the United States and Great Britain. In 1871, they settled the ownership of San Juan Island with the help of Germany. Two separate locations on opposite sides of San Juan Island are the American Camp and the English Camp. A fun history lesson is about the land dispute of 1859 — when a British pig rooting around in an American vegetable garden nearly started a war. For 12 years, the island remained under peaceful joint military occupation. Then in 1871, Kaiser Wilhelm of Germany ruled that San Juan Island belonged to the U.S. Months later, the British moved out, leaving a civilized camp complete with a formal garden. American Camp, located at 4668 Cattle Point Road on the southern peninsula, offers the main visitor center and hikes through wildflower-dotted prairies to the South Beach. The six-mile rocky beach is known for its orca viewing in the Strait of Juan de Fuca. Visit Grandmas Cove during low tide for tide pool opportunities. Stop by the visitor center and ask to see the nesting bald eagles. Picnic tables and restrooms are located here too. 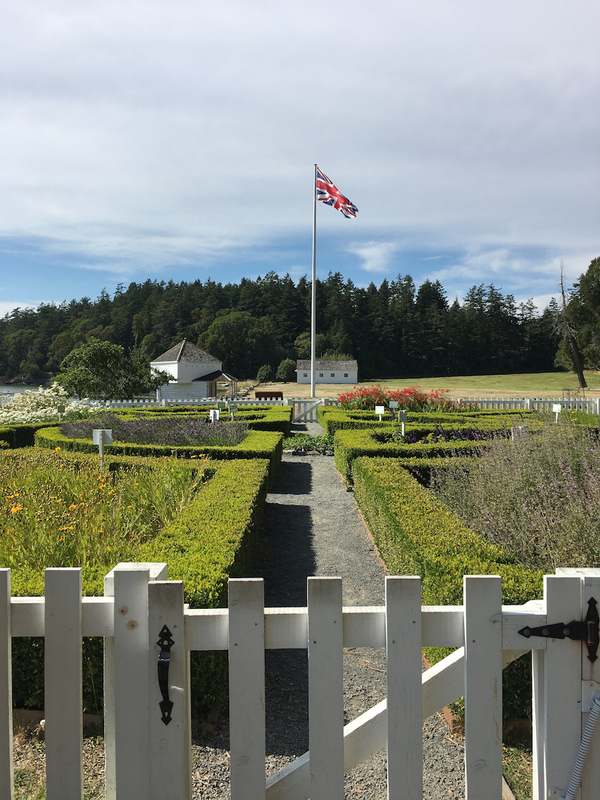 English Camp, located along West Side Road in the northwest corner of San Juan Island, offers more historic buildings including the barracks, the commissary, the block house and a formal garden. If time permits, the hike to Bell Point offer views of Garrison and Westcott bays. The visitor center at English Camp is seasonal. The Junior Ranger Program is the go-to program for families to learn more about San Juan Island National Historical Park. It’s free and takes about two hours to complete. My kids love the patches that the Rangers present them after completing their booklets. To earn the San Juan Island National Historical Park Junior Ranger badge, kids need to watch the park video, located in the visitor center at both locations. Also required is a hike and completing the same amount of activities in the Junior Ranger booklet as their age. San Juan Island National Historical Park offers a traditional Junior Ranger badge along with an embroidered patch. 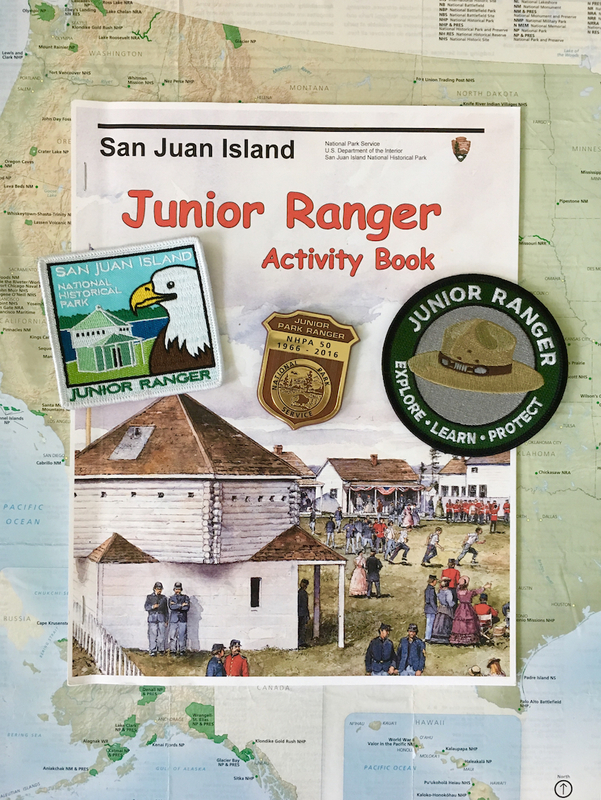 The Historic Preservation Junior Ranger badge and the Underwater Explorer badge can also be earned at San Juan Island National Historical Park. 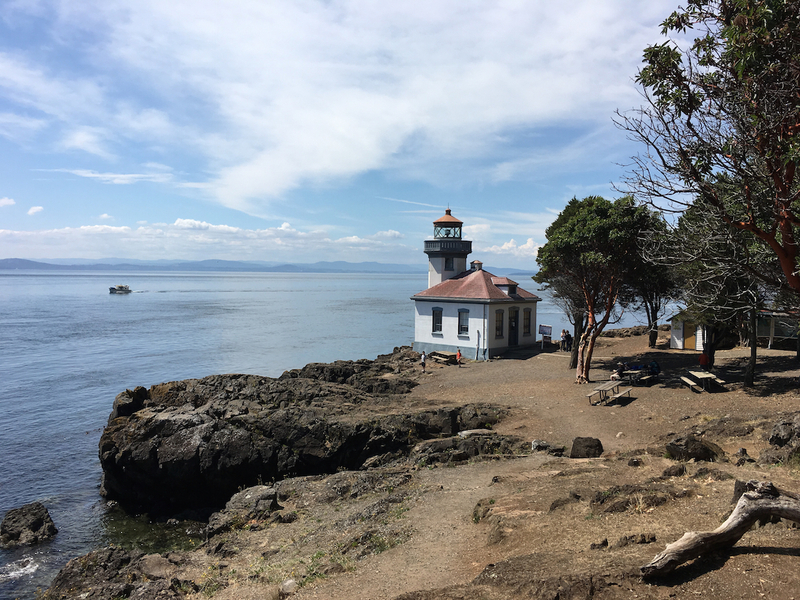 San Juan Island is a peaceful place to explore without stop lights and a 45 mph speed limit, a perfect scenario to explore this area by bike. During my visit to San Juan Island, we stopped at The Whale Museum, located at 62 First Street in Friday Harbor. Ideal for families who want to learn more about the whales. It’s a quick tour and can be toured in an hour. Adult admission is $6, kids 5 to 18 enter for $3 and kids under five enter for free. The lavender fields swaying in the gentle breezes of San Juan Island is nothing short of a watercolor landscape. During my visit, I stopped at Pelindaba Lavender (45 Hawthorne Lane) for the annual Lavender Festival held in July. Traveling Mom TIP: Looking for a premier location to scout for orca whales? Go to Lime Kiln State Park, in between the English and American Camps on the west side of San Juan Island. A quick hike from the parking lot, visitors can occasionally see a pod of orca whales from the shore. Check in at the 1919 lighthouse for the most recent information about sightings. One day pass is $10. My kids love animals, and I love to knit. So the next stop had to be the Krystal Acres Alpaca Farm, (3501 West Valley Road). With cuddly alpacas and a store packed with clothing and yarn, it’s a family-friendly stop. I love art and my kids needed to run around. We stopped at the Sculpture Park, near Roche Harbor. It’s a 20-acre sculpture park with 150 works on five marked trails, including a sand pit for kids to create their own art. Donations suggested. 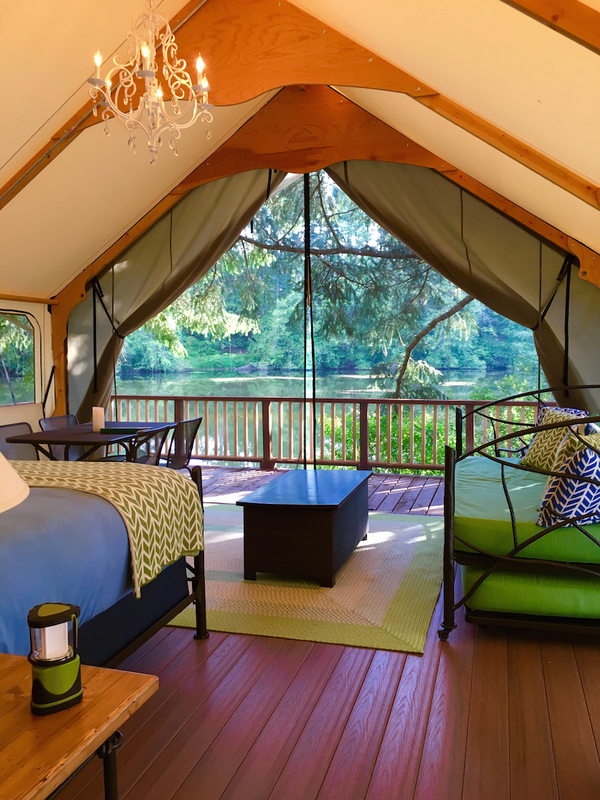 During my visit to San Juan Island, I glamped (glamorously camped) at the Lakedale Resort at Three Lakes, 5 miles from the Friday Harbor Ferry Terminal. It features a 10-room lodge, two pet-friendly log cabins, canvas cabins, and cottages, and a vintage Airstream trailer, as well as standard camping and RV sites. For my stay, my family had a canvas cottage ($$) along the shore of Neva Lake. The centerpiece of my canvas cottage was the chandelier that I never knew I needed until I had one. I especially loved looking at it from my king-sized bed dressed with a flannel duvet and shams. And did I mention my canvas cottage had decorative throw pillows? I found lots of them. The front of our cottage overlooked the lake with a large deck inches off the water. With a wall of bug netting that faced the lake we left the front open for our entire stay, just an incredible view first thing in the morning. The canvas cottage includes a twin-sized daybed outfitted with a trundle underneath and bedding. My kids loved sleeping on the trundle and day bed. The large and bright bathroom featured a jumbo shower head with hot water. The bathroom area included a dressing area with a full-length mirror with hangers along a closet rod. The pedestal sink had plenty of light to apply make-up and even had a blow dryer. The resort is heavily treed, so I didn’t see the RV or tent campsites from my site. Lakedale Resort didn’t feel crowded even though it was full. It’s quiet resort so I let my older kids explore on their own. My kids found lots of activities just for them, including free loaner bikes. We enjoyed a complimentary breakfast at the mess tent in the morning. So incredibly helpful when trying to feed the kids and make it to the ferry on time. During my visit, I took the Washington State ferry to Friday Harbor from Anacortes, Washington, 85 miles north of Seattle via Interstate 5. It was easy to load my SUV and head to the top deck for a scenic ride. For visitors without cars, floatplanes offer service to San Juan Island from several destinations including Sea-Tac (Seattle-Tacoma International Airport). Friday Harbor offers plenty of moorage for boat owners. San Juan Island National Historical Park’s grounds are open 365-days a year from dawn until 11 p.m. Visitor Centers are located at American Camp, open year-round, and English Camp, seasonal. 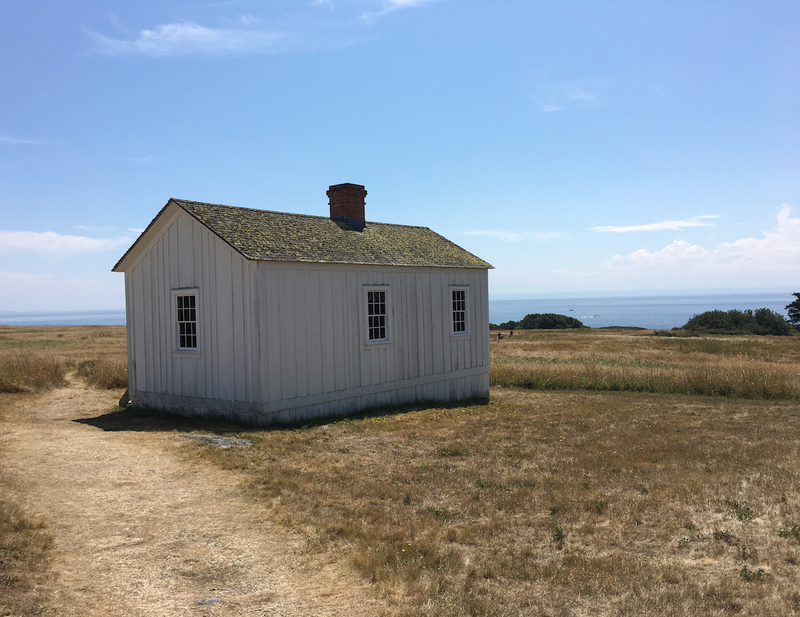 The San Juan Island National Historical Park is free. Friday Harbor is your place for stocking up on San Juan Island. I found all I needed for a picnic and a camp fire cookout at the grocery store. 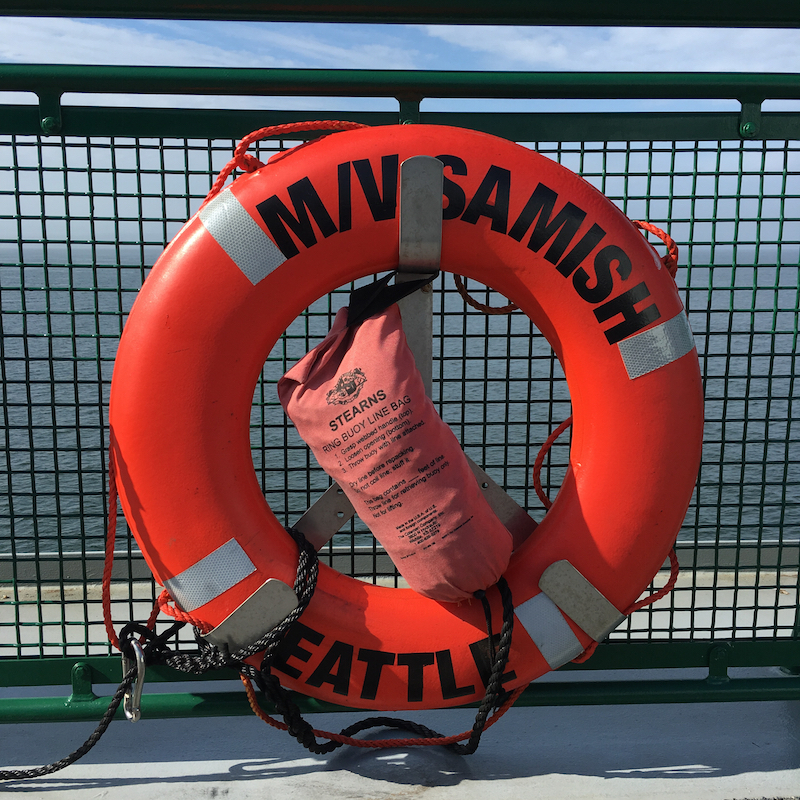 Reservations for the Washington State Ferry are highly recommended, only 10% of the ferry capacity is available for drive-up passage. 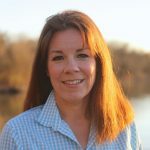 A great article. Brings back lots of memories of the 6 weeks we spent there working at English camp. We’re back in Texas now for the winter. We’re seeing friends and family and tonight we’re dancing to western music. I love Texas and I loved my time exploring Washington. I hope my travels return me there soon. Wow, that glamping resort looks amazing! Thanks for the info. Elizabeth, My kids loved it. I loved the hot water, the view and the chandelier! I passed that camping resort and wondered about it. Looks like fun! My kids’ favorite camping spot of our 9-week road trip. San Juan was a new discovery for my family since we live in Texas. The summer weather was perfect and the laid back attitude made for the ultimate getaway for me. I hope my travels take me back to San Juan sooner rather than later. We’re so glad you and your family enjoyed your visit. I have glamping envy! One day I’ll do a staycation and spend the weekend at one of Lakedale’s canvas cottages.